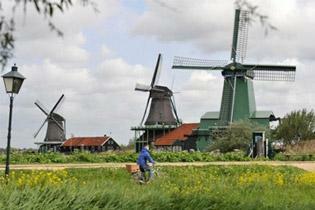 The polders, often consisting of many rectangles of damp meadows separated by ditches, are encompassed by dikes and canals. When you cycle on a dike you’ll be able to see the difference in water levels between the canal on the one side and the lower lying ditches in the polder on the other side. This cycle tour will also take you to the dunes on the North Sea coast which not only protect the hinterland from the sea but also harbour many species of dune flora and fauna. You will certainly enjoy the coast of the former Zuiderzee (now Lake IJsselmeer) and the small towns of Edam and Volendam. 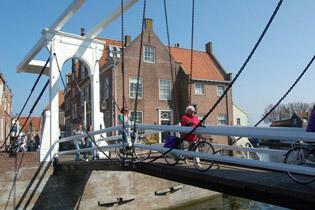 Your bike holiday would not be complete without a visit to attractive Amsterdam.